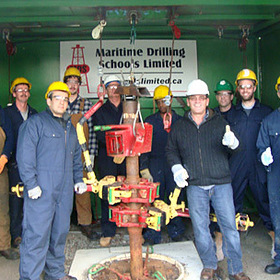 Maritime Drilling Schools Limited offers a one-of-a-kind Roughneck Training and is located in North Sydney, Nova Scotia. The school is an industry accredited Post Secondary Private Career College and offers opportunities to individuals from all walks of life like general laborers, former military personnel, teachers, and much more. The 20 day course offers an extensive knowledge of all positions on land and offshore gas and oil rigs. The school was founded by Reg MacDonald who started in a kitchen on an offshore oil rig and then worked his way through nearly every position a rig has to offer. Mr. MacDonald has worked on every type of land and offshore rig made and has 30 years of experience in the drilling industry. He is now one of the most elite IADC drilling instructors in all of Canada. So...are you ready to be a Roughneck? Check out their links page to find out how.